From 1st October 2008, new government rules have applied on the paving over of front gardens. Planning permission is now required to lay traditional impermeable driveways that allow uncontrolled runoff of rainwater onto the roads because this can contribute to flooding and pollution of watercourses. The new planning rules aim to reduce the volume of water running from driveways directly into urban drains. A permeable paving system enables rainfall to soak into the subsoil where it can drain harmlessly away rather than run off into hard pressed drains. 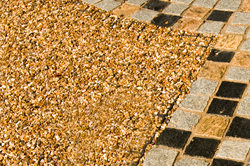 The area of hard surface is constructed using a permeable product such as from Marshalls Priora range or Marshalls Grassguard. There is no limit to size in this case. Provision is made for rainwater from traditional impermeable hard landscaping to drain into a soft landscape such as grass or border planting with sufficient permeability, or into a specially constructed soakaway. If the area of hard surface intended is less than 5 square metes. Elsewhere around the house there are no restrictions on hard surfaces at or near ground level. The new legislation only affects front garden areas. 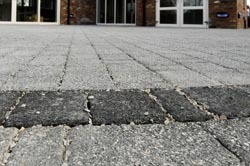 GWH Paving Services have successfully completed a course relating to the design and construction of domestic permeable driveways using Priora and Tegula Priora Block Paving. It is the homeowners responsibility to apply for planning permission. Applying for planning permission will require the householder to fill in an application from, provide plans (which have to be to scale) and pay a fee of £150. Planning applications for this type of development should normally be decided within 8 weeks of submission. This also applies for existing hardstanding where areas are being replaced. For further information and assistance, please see the government Planning Portal Website or contact GWH for further advice on a project.